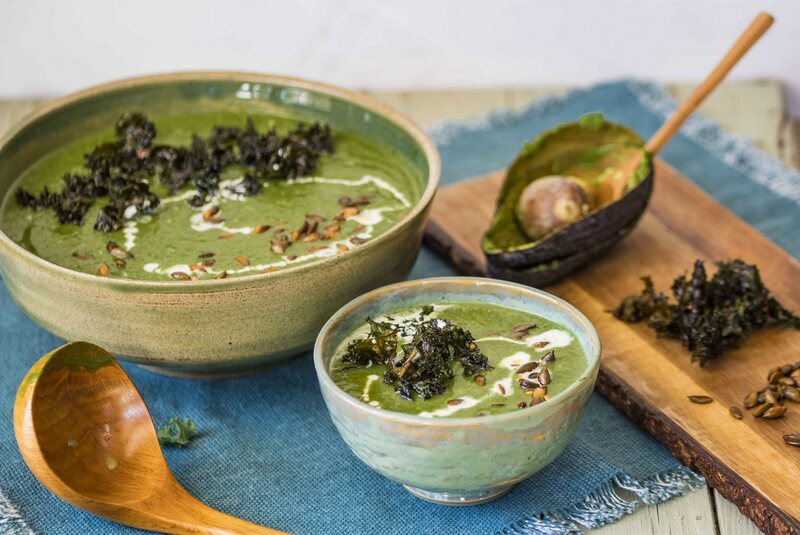 By adding the avocado, the soup gets a delicious creamy texture and flavor. The crispy kale provides the "bite". This soup is a healthy and filling hearty soup, perfect for lunch. Cut the onion and garlic into small pieces. Cut the leek into rings. Put 1 tbsp oil in a deep pan and simmer the onion, garlic and leek. Add the fresh spinach (not all at once because there is a lot of volume). When the spinach has shrunk, add the vegetable stock and simmer for 10 minutes on a low heat. Put off the heat. Remove the flesh from the avocado and add it to the soup. Mix everything into a soft creamy soup. seazon with pepper and salt. Remove the hard stems from the kale. Tear the leaves into pieces and put them in a bowl together with the pumpkin seeds. Add 1 tbsp oil, pepper and salt and mix well with the kale and pumpkin seeds. Line a baking tray with baking paper. Spread the kale and seeds over the plate and bake in a preheated oven for 15 minutes at 180º. Spoon the soup into the plates. Add 1 tbsp coconut cream. Decorate with the crispy cabbage and pumpkin seeds. Tasty!